to Experience "The Wizarding World of Harry Potter"
and "The Making of Harry Potter"
In celebration of the opening of "The Wizarding World of Harry Potter™" at Universal Studios Hollywood on April 7, the global entertainment destination and TripAdvisor, the world's largest online travel site, are launching the Ultimate Harry Potter Trip Around the World sweepstakes sending one winner and three guests on a once-in-a-lifetime magical journey to experience the wonders of Harry Potter experiences across the globe. This exciting contest, which kicked off on January 14, will whisk the sweepstakes winner and three guests on a spellbinding voyage to visit "The Wizarding World of Harry Potter" locations around the world beginning with the Grand Opening at Universal Studios Hollywood and including lands at Universal Orlando Resort and Universal Studios Japan. The winners will also visit "The Making of Harry Potter" at Warner Bros. Studio Tour London, where they can discover behind-the-scenes filmmaking secrets at the home of all eight Harry Potter blockbuster films. Fans can enter to win at tripadvisor.com/wizardingworldhollywood. More than five years in the making, and inspired by J.K. Rowling's compelling stories and characters that were brought to life in the Warner Bros. films, "The Wizarding World of Harry Potter" is being masterfully recreated at Universal Studios Hollywood and will be faithful to the visual landscape of the fiction and films, including Hogwarts castle which will serve as its iconic focal point. An achievement in pioneering theme park ride technology, "Harry Potter and the Forbidden Journey" will make its U.S. debut at Universal Studios Hollywood in hyper-realistic 3D-HD designed to further immerse guests in an already engaging storyline. The multidimensional thrill ride features a groundbreaking robotics ride system, fused with elaborate filmed action sequences and immersive visceral effects. In this updated adaptation of the ride, guests will sport Quidditch-inspired 3D goggles as they venture through journeys experienced by Harry and his friends, spiraling and pivoting 360-degrees along an elevated ride track on a whirlwind adventure of a lifetime. The Ultimate Harry Potter Trip Around the World sweepstakes began on Jan. 14. 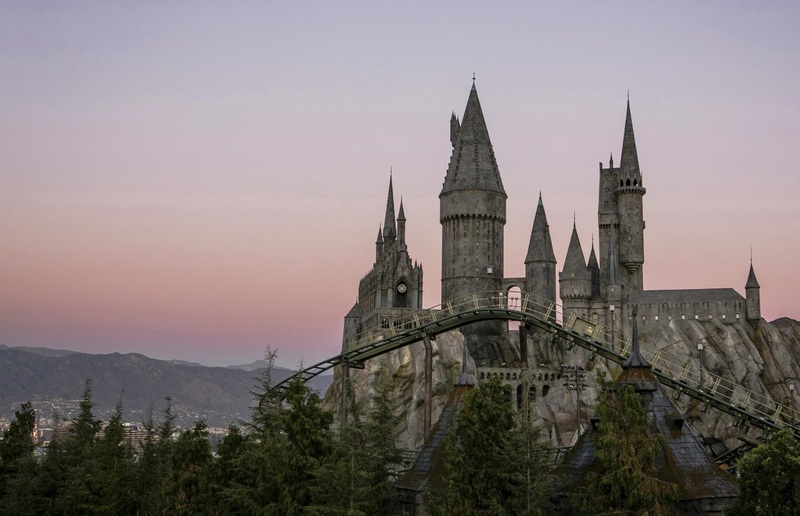 Fans have until February 24 to register and can enter to win at tripadvisor.com/wizardingworldhollywood. The winner will receive a trip for four people, including airfare, four night accommodations at each location, ground transportation, 2-day theme park tickets for each theme park and tickets for Warner Bros. Studio Tour London. U.S. citizens, 18 years of age and older are eligible to enter. Additional eligibility information is available at tripadvisor.com/wizardingworldhollywood. As the countdown to the April 7 opening date continues, the website invites guests to learn more by signing up for the latest news and information at universalstudioshollywood.com/harrypotter/signup. Universal Studios Hollywood, The Entertainment Capital of L.A.SM, includes a full-day, movie-based theme park and Studio Tour; the CityWalk entertainment, shopping and dining complex, the Universal CityWalk Cinemas and the "5 Towers" state-of-the-art outdoor concert venue. World-class rides and attractions include the renowned, behind-the-scenes Studio Tour featuring the intense "King Kong 360 3-D" attraction and the all-new "Fast & Furious—Supercharged" thrill ride as the Studio Tour's grand finale. Other popular rides include the 3D-HD adventure, "Despicable Me Minion Mayhem" and immersive "Super Silly Fun Land," the critically-acclaimed mega-attraction, "Transformers™: The Ride-3D," "Revenge of the MummySM—The Ride," "Jurassic Park® —The Ride," "Springfield," hometown of America's favorite TV family, adjacent to the award-winning "The Simpsons Ride™" and the "Nighttime Studio Tour" which runs on select evenings. Universal Parks & Resorts, a unit of Comcast NBCUniversal, offers guests around the globe today's most relevant and popular entertainment experiences. With three-time Academy Award winner Steven Spielberg as creative consultant, its theme parks are known for immersive experiences that feature some of the world's most thrilling and technologically advanced film- and television-based attractions. Comcast NBCUniversal wholly owns Universal Studios Hollywood, which includes Universal CityWalk Hollywood. It also owns Universal Orlando Resort, a destination resort with two theme parks (Universal Studios Florida and Universal's Islands of Adventure), four resort hotels, and Universal CityWalk Orlando. In addition, Comcast NBCUniversal owns a majority interest in Universal Studios Japan, in Osaka and has a license agreement with Universal Studios Singapore at Resorts World Sentosa, Singapore. The company has also announced plans for a theme park in Beijing. About Warner Bros. Studio Tour London – The Making of Harry Potter is a unique attraction offering visitors the ultimate opportunity to journey behind the scenes of Harry Potter and experience the magic that has gone into creating one of the most successful film series of all time. Visitors are able to step into the original Great Hall, first built for Harry Potter and the Philosopher's Stone, experience green screen technology and marvel at the breathtaking miniature scale model of Hogwarts castle. Located at the Studios where all eight films were produced, the attraction allows visitors the chance to see firsthand the sheer scale and detail of the actual sets, costumes, animatronics, special effects and props that have been used throughout the Harry Potter film series. TripAdvisor® is the world's largest travel site, enabling travelers to plan and book the perfect trip. TripAdvisor offers advice from millions of travelers and a wide variety of travel choices and planning features with seamless links to booking tools that check hundreds of websites to find the best hotel prices. TripAdvisor branded sites make up the largest travel community in the world, reaching 375 million unique monthly visitors, and more than 250 million reviews and opinions covering 5.2 million accommodations, restaurants and attractions. The sites operate in 45 countries worldwide. ← RYAN REYNOLDS SURPRISES FANS AT PRIVATE SCREENING OF ‘DEADPOOL’ FOR FAN APPRECIATION IN L.A.